Rosie and Jessica's Day of Fun – Page 12 – Things we do and make and see. In episode 19, Rosie and Jessica launch into the new year with a look back at the old, bringing you their Year of Fun review. Plus there have been plenty of trips to the theatre and Christmas parties to report, as well as the Third Annual New Year’s Eve Lee Pace Film Festival. All will not necessarily be explained. In episode 18, Rosie has been to some fancy dinner parties, but lowers the tone by enthusing about the new Nintendo, Jessica has been to the theatre and had found a bar with blankets. Rosie and Jessica take you through their Top 5s crafts and of course bring you a Strictly update. Plus a catch-up on Operation Get Festive! 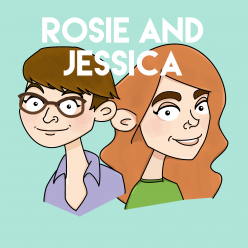 In episode 17, Rosie and Jessica have been to some Christmas fairs, both planned and accidental, Jessica’s been to the cinema and Rosie’s been to the BFI. There’s discussion of upsides of feminism, Strictly chat, and Top 5 TV Theme Tunes, and in Needle and Fed, Rosie has finished her jumper, to much jubilation. In episode 16, Jessica gives us her take on the Hollywood Costume exhibition at the V&A and disgusts Rosie with talk of the titular pudding. We have Strictly Update, a last-minute, wildcard-entry Needle and Fed and, in keeping with Jessica’s trip, a rundown of the Top 5 Costumes. Plus top tips for what to do if you’re housebound by the weather. This episode was produced by Intern Walter. In episode 15, Rosie manages to stretch her birthday celebrations out for an absurdly long time, Jessica reports on an exhibition she went to ages ago and Rosie reports on some excellent food she’s had out and about, plus a Cholera Outbreak. There’s a Strictly Update, Top 5s, a Snack of the Week and some disappointed animals. In episode 13, we return for a bumper back-to-school (ish) special. We get you up to speed with what we’ve done since Edinburgh, review the Disney film Tangled, leading to a rundown of our Top 5 Disney films. Plus some of our knitting is actually really almost practically finished. There’s work-based baking, a lot of books read and some tiny wee princesses.